There is not much knitting going on this week, I have trapped a nerve, kind of at the top of my back/shoulder area, so doing anything for any length of time is a bit painful. This also means that food shopping and carrying heavy things is out of the window too. Though my lot would love me if I starved them! So what am I knitting, this bag in Kid Classic in a purply colour and I just bought dark grey to trim it with. It is for my sister-in-law she saw it in John Lewis and liked it, I still have Jakes other Fetching to finish, em start, and I have lost a sock in progress, its for my Dad and is on 2 circs so I have been struggling with it and I have no idea where I last had it, it better turn up soon or it will be for his birthday in February instead. Don’t let me fool you into thinking that is all the wip’s, its just all I am thinking of working on right now. Tomorrow I have to take all my packages for the UK to the post office, they are REALLY late. 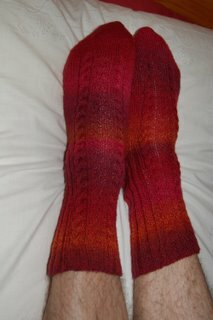 So here is a pic of my brothers socks modelled by someone else they are not identical but I like them anyway and my little Forest Canopy Shawl in Plassard Alpaca which I love. ooh ouch ! I have a bad back that comes and goes (more comes lately unfortunately) so you have my sympathy. LOVE the colour of your brother’s socks – hot ! Just been to the post office myself – lines out the door – over a 45 minute wait, 3 days past the last posting date home. Oh well, its done thank goodness. 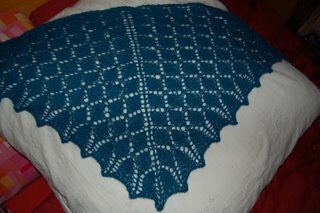 I love that shawl – I may just get tempted to make one! Sorry to hear about the pain, hope it goes away soon. It was good to see you last week and I’ll admit I was tempted by that bag as well! I still haven’t bought some presents and still have knitting to finish and sew up tomorrow! I hope your back feels better soon — I had a little twinge of that recently (I blame a cold draft more than anything else) and it’s finally easing up a bit. Those are great socks. For the past two or three days, I’ve had a strange pain and stiffness in one of my finger joints in my right hand. It’s not stopping me from knitting, but I do want it to go away. Please, no arthritis! I hope your back is soon better. Take care of your back. It’s probably a reminder to go slow. This is a crazy time of year.